Does anyone remember what the economic conditions of the United States were like back in 2007 before the failures of the system started and eventually turned into the Great Recession? Things were good, very similar to the way they are today. It has been 10 years since the Great Recession took hold of the United States, and the American government has done an admirable job helping the economy and its citizens recover from what might be considered the second-worst economic disaster in the nation’s history. But the continued growth in the stock market and the historically low numbers in terms of unemployment are considered by some economists to be unsustainable. A downturn of unknown severity is predicted by some economists who worry that a bull market cannot be sustained indefinitely. They think that because bull markets never last forever. There is no concrete reason to expect a downturn in the economy to become a full-blown recession, but there is no guarantee it will not reach similar cataclysmic points. The question is whether we as a country and an economy are better prepared for the downturn this time than we were the last time. 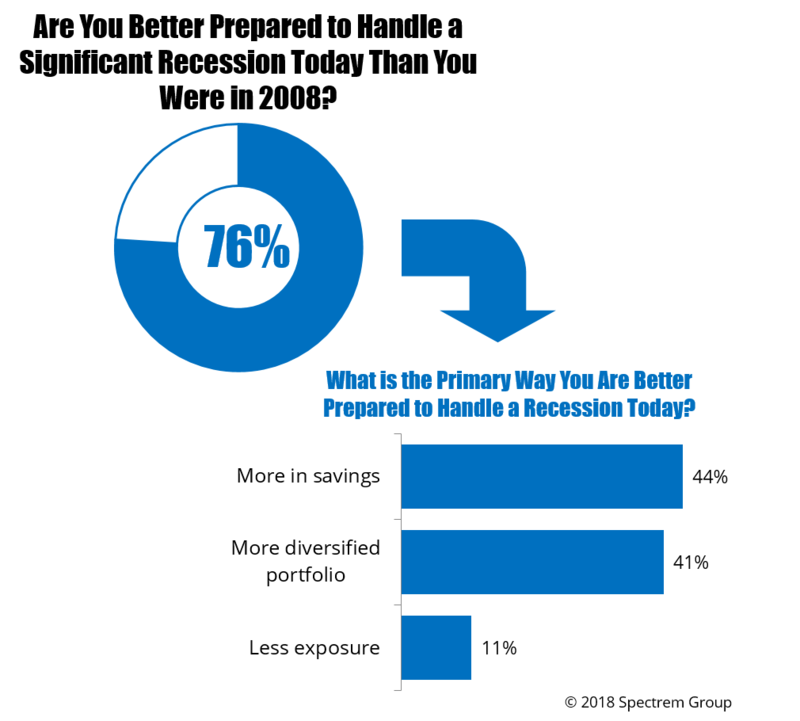 The situation also begs the question “Are investors better prepared this time?” In its monthly survey of affluent investors, Spectrem asked investors to state where they stand today versus where they were 10 years ago when the Great Recession occurred. The initial question offered a general understanding of the status of investors today. Asked “are you better prepared to handle a significant recession today than you were to handle the recession in 2008?" Seventy-six percent of investors said “Yes”. That is obviously a good sign. It is an indication that investors and the advisors who assist them in making investment and portfolio decisions learned something from the horrific economic events in 2008. There are some groups with greater concern in this area. Only 66 percent of Educators said they are better prepared now than they were then, and only 69 percent of females feel better prepared, as opposed to the 80 percent of males who feel that way. Notably, there was virtually no difference in terms of responses based on the age of the investor, with the exception of the youngest group (Millennials, under the age of 36), which may have had little chance to be prepared back in 2008. What makes investors feel they are better prepared to handle a significant economic downturn this time than last? Of those who said they are better prepared, 44 percent said they have more money in savings now than they did back then, and 41 percent said they have a more diversified portfolio, which does prevent an investor from suffering as harshly if one industry (say, banking) suffers most from an economic calamity. It seems Vonnegut’s warning may be most effective for financial advisors to discuss the Great Recession and its lessons with investors. Sixty-six percent of investors say their advisor has discussed protecting their portfolio against a future recession with their advisor. That, however, appears to be more true among wealthy investors; almost three-quarters of investors with a net worth over $5 million have discussed this topic with advisors, while only 60 percent of those with less net worth have had that conversation. Is it disingenuous to discuss potential downturns in the economy when everything is gong so well? Putting the brakes on investors who are willing to ride the wave of economic growth is counterintuitive to advisors who benefit from such enthusiasm, but many personal fortunes were lost the last time the bull economy crashed. The comparisons of economic conditions in 2007 and today are fair. There are warnings signs that a downturn Is possible, and many economists will warn that a downturn is inevitable, because there is always a market correction. Investors will benefit from some wisdom, understanding that when times are good, it is the best opportunity to prepare for the bad times.